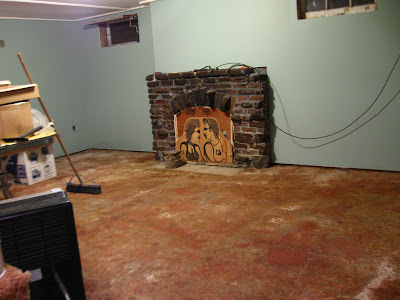 I scraped up all the vinyl tiles from the basement floor and it looked like there was nothing else left for me to remove from the space, so I could finally paint the fireplace. 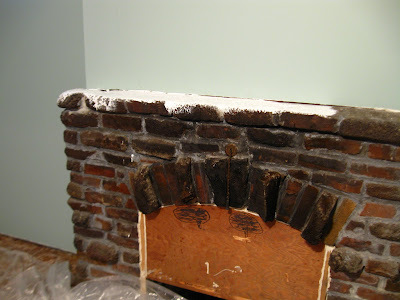 There's no unpainting a fireplace, so you have to be really really sure you want to do it. I was sure. But first I had to remove Hall and Oates. I was terrified there would be dead animals or something sinister (like SPIDERS!) 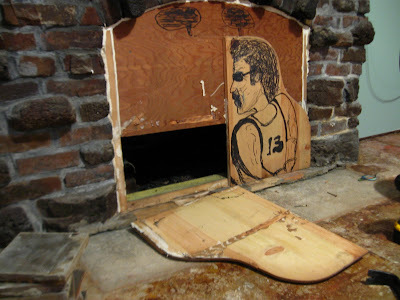 in the grate. I removed the screws and got my prybar and popped Hall off. Then I scurried back super fast. There wasn't anything terrible in there. 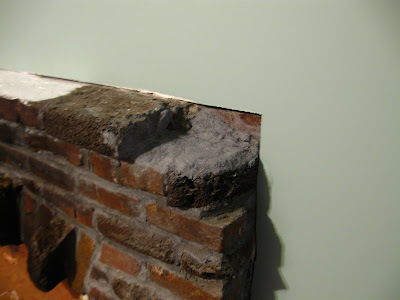 There was something pretty good, actually: one of the missing bricks from the right side of the fireplace! Sweet. I vacuumed the bricks really thoroughly to get any loose grit or mortar out. I used a little TSP to clean the front bricks that were looking charred, though it didn't seem to do much. Then I just grabbed plain old white latex paint and started painting from the top down. I used a regular brush instead of a roller because the fireplace is made of clinker bricks and what looks like pumice stone. The surface is very porous and uneven. 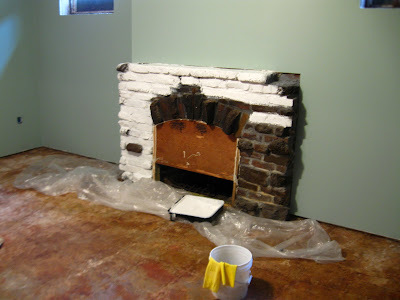 According to classicbungalows.com, "Clinker bricks were the result of wet bricks being placed to close to the fire in the kiln, resulting in bricks that were darker-coloured and in either ‘melted’ or ‘exploded’ shapes. The surface texture of the bricks could range from glassy to pock-marked from the uneven heat. Richer, darker colours of the ‘clinker’ bricks were another welcome result from the extra heat." 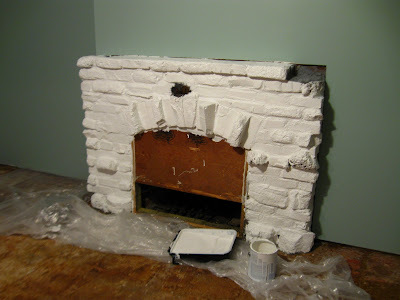 The funny thing is that I was absolutely sure I wanted to paint the fireplace. When I posted the pictures on Facebook a friend told me they were clinker bricks, something I didn't know previously. All of the sudden I felt despair over what I had done. They were historical! Used in the Arts and Crafts movement! Now the only thing that could restore them was a sandblaster. But I think it's going to be okay. Next weekend we are installing the laminate and hopefully it will start to feel less like a basement and more like another room in the house. 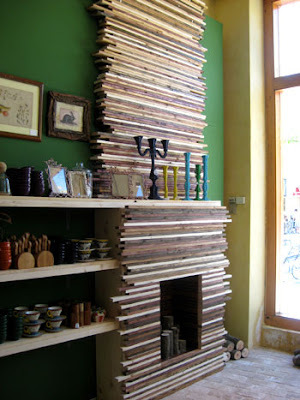 I want to do something like this over the fireplace to warm up the space. And of course I'll hang Hall and Oates. And the disco ball. Too much? My kingdom for a yardboy!